On behalf of the IACLEA membership, the director of government and external relations and IACLEA members engage with federal executive branch agencies, Congress, and national associations to promote the interests of campus public safety executives and their agencies. Makes federal public safety officers benefits available to the families of sworn law enforcement officers employed by private colleges and universities. 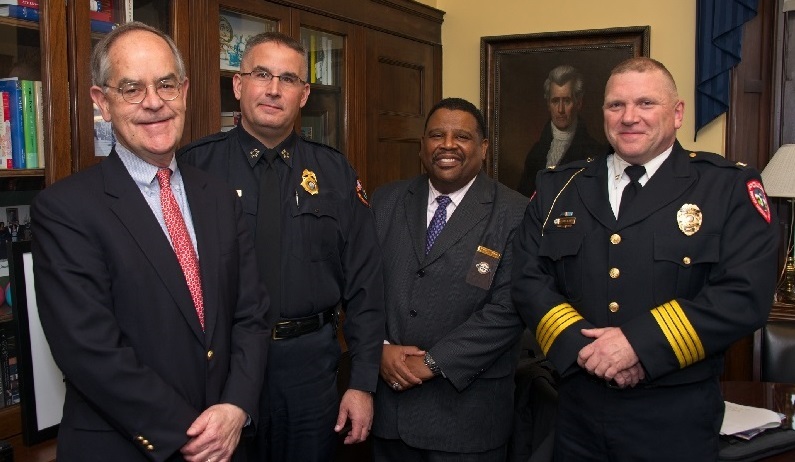 IACLEA continues to engage with the U.S. House of Representatives Committee on the Judiciary and will initiate contact with allied national organizations, such as the International Association of Chiefs of Police (IACP), to foster support for this legislation. Read IACLEA's ISSUE BRIEF on the Officer Sean Collier Campus Police Recognition Act. IACLEA asks Members of Congress to thoroughly review the US Department of Education’s proposed changes to Title IX and assess its future impact on Institutions of Higher Education. IACLEA is opposed to additional regulations on Institutions of Higher Education that will cause more burdensome reporting work, taking away from the real duties of Public Safety Officials and Administrators. These types of regulations will negatively impact public safety on campuses and within the IACLEA community. Read IACLEA's ISSUE BRIEF on the Proposed Title IX Regulations. Makes it unlawful to sell or transfer a firearm in any transaction without a background check. Read IACLEA's ISSUE BRIEF on Background Check Acts. The REACH Act will amend the Clery Act to require colleges and universities to include statistics on reported hazing incidents in their Annual Security Reports and to implement an anti-hazing education program. The IACLEA Board of Directors provided review and comment to the lead sponsor’s staff. Title IX is an important law for assuring equal access to education and an education system that is safe and non-threatening for all our citizens. Utilizing Title IX subject matter experts, the International Association of Campus Law Enforcement Administrators (IACLEA) provided comments on the U.S. Department of Education’s proposed Title IX regulation changes to the Federal Register on January 28, 2019. After reviewing the proposed Title IX regulation changes, IACLEA submitted an 11-page outline of the provisions that it agrees with and those that cause some concern. To view IACLEA's position statement on reducing gun violence and keeping campuses safe, please see the next page. To view IACLEA's resolution on carrying concealed firearms, please see the next page. The goal of the Association’s Government Relations program is to build and foster strong and lasting relationships with relevant federal agencies and Congress in order to advance the campus public safety profession and promote policies to enhance its ability to protect our higher educational critical infrastructure, research facilities, students, faculty, staff, and visitors.